Downloadable text files: Afghanistan data, Iraq data. Data sources: Iraq – 05/2003 through 04/2010, Iraq Index by the Brooking Institute, May 2010 issue; 05/2010, various news reports. Afghanistan – 09/2001 through 11/2008, Troop Levels in the Afghan and Iraq Wars by Amy Belasco, Congressional Research Service; 12/2008 through 11/2009, Troop Levels in Afghanistan Since 2001 by the New York Times; 12/2009 through 04/2010, read from Figure 1.13 of Afghanistan Index by the Brookings Institute, May 2010 issue; 05/2010, various news reports. Updated to show data through Nov. 2010. 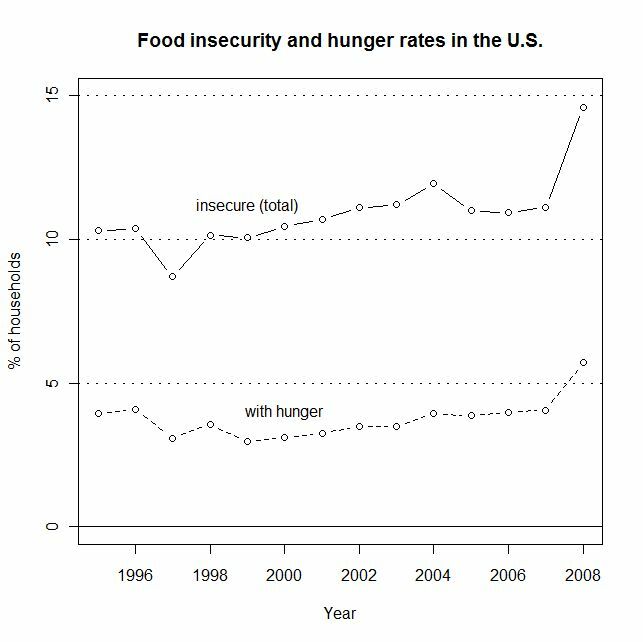 Food insecurity and hunger in the U.S.
Data sources: The Statistical Abstract of the U.S. 2010 (table 209), 2004-2005 (table 196), 2000 (table 233). Starting at 2006, the “with hunger” category was renamed to “with very low food security”. See the sources for definitions. Updated (Jan 25, 2011) with 2011 Statistical Abstract data (Table 210) to show 2008 values. Update (Sept. 17, 2013): A USDA report has the data up to 2012. The elevated insecurity levels first observed in 2008 have remained stable since. In 2012, 14.5% of households were food insecure, and 5.7% had very low food security. This post addresses what I consider to be the main argument against regulation of the activity of uttering ideas. I note that that “uttering ideas” – to friends, or to small groups, in a setting that does not require much resources or authority to arrange – is separate from the activity of broadcasting ideas. I argued before that the latter activity – essentially engaging in a competition for the attention of large numbers of people – is always regulated in one way or another by government and is therefore subject (at least on some level) to different considerations and treatment. The argument against regulating the utterance of ideas is that a such regulation infringes on what Robert Dahl calls a “democratic right”, (or could alternatively, and perhaps better, be called a democratic need). These democratic rights or needs are activities that are essential to democracy (i.e., to political equality).